Dante Rivas – the guy who made the passports run on time. We miss this guy. Looks like what once was a problem solved is coming back with a vengeance: getting or renewing a passport is once more becoming an ordeal for ordinary Venezuelans. 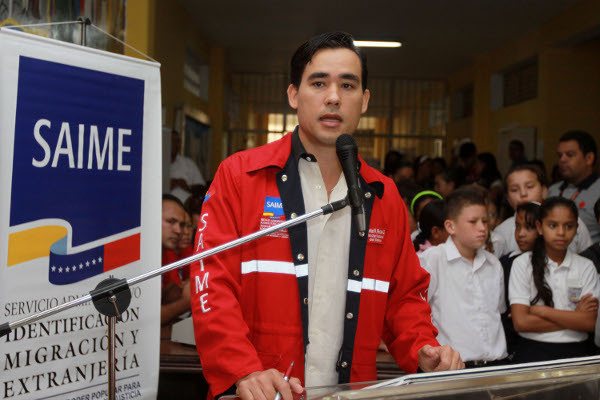 Former MP Juan Carlos Dugarte, who has been the head of SAIME (Identification and Migrations Service) since last month, has publicly admitted the recent delays and has pledged to solve the problems by increasing the supply of passports. Perhaps the bigger problem is an overall deterioration in the quality of SAIME’s service. Many believe this begun with the departure of Dante Rivas last year. To prove it, Chavista blog El Parroquiano launched an investigation and found some differences between then and now: when Rivas was in charge the service was uninterrumpted during lunchtime, but now all work stops between noon and 2 p.m., even if people are waiting in line. Other problem is obtaining a personal appointment to get a passport. In this case, I can judge from experience: When I got my passport a few years ago, the appointment was set in a matter of days thanks to Internet and a text message. A friend of mine was recently told he’d have to wait at least six weeks to get a date to visit his local SAIME office. When the efficiency of a service is strongly attached to the presence of one person, that tells you something about the robustness of the entire system. Trouble is, there just aren’t enough Dante Rivases to go around inside Chavismo. Nowhere near enough. Next articleBusiness Plan! Business Plan!